The Aussie playmaker wants to go one better than last time at next year’s tournament in Japan. Done deal: Australia fly-half Bernard Foley. WALLABIES FLYHALF Bernard Foley has unfinished business ahead of the World Cup, re-signing with Rugby Australia (RA) and the Waratahs until the end of 2019. Foley, 29, recommitted to RA despite offers from overseas, with next year’s World Cup a target. The playmaker said he wanted Australia to contend in Japan in 2019 after being part of the Wallabies’ losing team in the 2015 final. “I’m really happy to re-sign and now focus on pushing ahead to focus on what’s a really big season next year,” Foley said. “The World Cup is obviously a major carrot and I’ve got a lot of belief in this group that if we continue to work hard and focus on improving every day, then we can push deep into the competition. “Right now though, I’m just concentrating on a really important run of games coming up. We can’t rest on our laurels and there’s a lot of hunger in the squad to keep improving. “I’m fully invested in rugby in Australia, at both a national and international level. I feel there is a bit of unfinished business especially after going close at the last World Cup. Foley has played 64 Tests for the Wallabies and is the fourth highest points scorer for Australia with 593. Wallabies coach Michael Cheika was thrilled Foley re-signed, but believes the fly-half will be in Australia beyond next year. “I’m very happy that Bernard has signed on but I don’t believe this will be his final year in Australian rugby,” he said. “He has set himself a big challenge by going from year to year and I’m sure he’ll meet it. Email “Bernard Foley eyes World Cup after re-signing with Wallabies, Waratahs”. 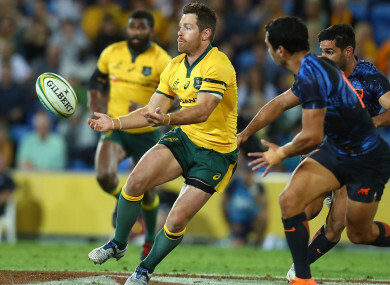 Feedback on “Bernard Foley eyes World Cup after re-signing with Wallabies, Waratahs”.